Here is some more of Anams fabulous work, along with what product she used to create it!!! First up is a layout entitled "Enjoy Life"
The flowers were made by hand cutting, using the flower from the die cut sheet as a guide. Other supplies: Saddle Brown Stazon, Brown Edging Chalk Ink, PC & Printer for Journaling & Stix2 Adhesives. We love both of these projects, Anam!! Look at this super cute hanging frame below!!! 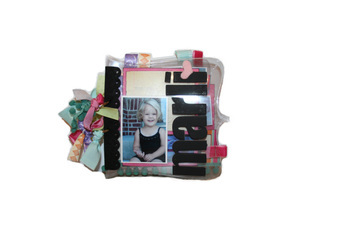 Description: Hanging frame with movable photo. I made this so i could replace the photo as I wanted. Note: my photos don’t pick up some of the detail,just so you know, this item has a slight shimmer to it as I covered the chipboard circle with the green paper and then applied a coat of glitter glaze - the same glaze has been applied to the other chipboard which has been painted white. Other supplies: White Acrylic Paint, Glitter Glaze, Stix2 Adhesives. Here is a closer look at the detail put into this work of art!! It's been a few days since our last post, so I thought I'd drop in and share a couple of quick tips that can be done on one of our latest and greatest products! Most stores have received their orders from the CHA show and one of the most popular products for this release was our new Transparent Die Cuts! These die cuts are one of my favorite releases because they are so versatile and fun to use! We know that there are some great acrylic albums and shapes out on the market so we wanted to try something a bit different to meet other needs that paper crafters might have! 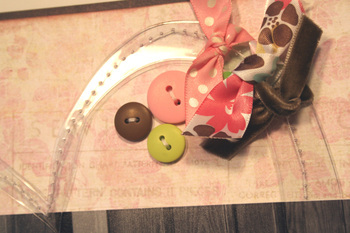 So, our transparent die cuts are thick enough to create a fun mini album, yet thin enough to add lots of embellishments! Here are a couple samples that you've probably seen here and there, but we wanted to zoom in and focus on the details :)! The layout uses the large heart from our Clearly Bigger set and letters from our See Through Letters set...We've actually used a sewing machine to stitch and add detail to the heart. It's a cool and quick technique that adds a lot of detail and interest to the design! And below have a peek at our Bracket Book Set. We've used a great variety of product in this book...felt shapes, buttons, ribbons, chipboard...you can stitch buttons directly on to the transparent shapes! Get creative...we'd love to see what you've done with the Transparent Die Cuts...send them over to megan@fancypantsdesigns.com and we just might feature your fabulous designs here on the official Fancy Pants Designs blog! We have a fabulous guest designer that we want to intoduce to all of you!! Anam Stubbington!!! Check out Anam's bio and how she found herself in this spot!! All through the coming weeks, we are going to be posting some Anam's wonderful designs! Congrats Anam!! My name is Anam Stubbington. 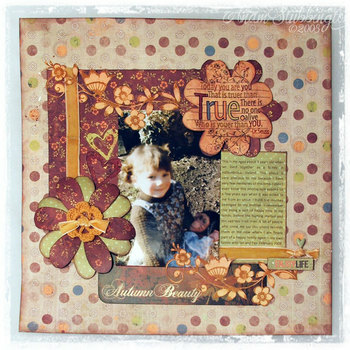 I have been into pretty paper and creating art for years but got addicted to scrapbooking about 5 years ago, while I was pregnant with my little girl. It combined 3 loves: paper, photographs and memories. 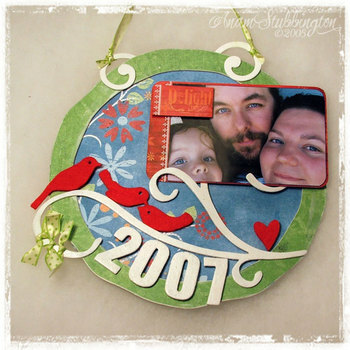 I have since amassed a huge amount of scrapbooking stash and have filled many albums with memories. I love working with paper, using my sewing machine and my computer to create my memories. I love scrapping outside my 12x12 box, trying new techniques and learning from others as well as sharing knowledge. I am totally stoked to have a chance to create for Fancy Pants as they have always been one of my top scrapbooking companies. I think I own at least 1 sheet of all of their ever released papers and am starting a pretty nice collection of their very yummy felt products!! And thanks to my wonderful Boss ie Chantel at Treasured Memories, I have some of the newly released CHA products that I am stroking a lot! I currently live in Edmonton, Canada with my arty hubby Ian and our little girl Fay (with a bump on the way for July.) 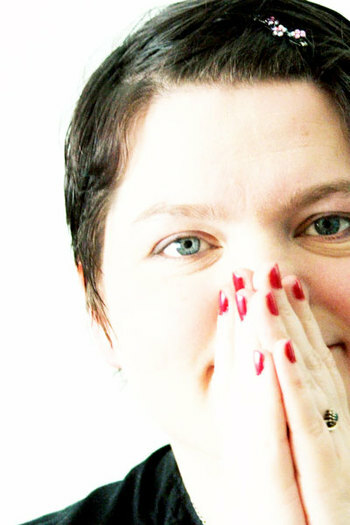 You can find out more about me on my blog ‘a little of my life’ at www.anamstubbington.typepad.com. In August 2007, There was a manufacturer sponsored contest on PubCalls blog (www.pubcalls.blogspot.com ) by Fancy Pants (link - http://pubcalls.blogspot.com/2007/08/new-manufacturing-challenge-with-fancy.html ). The top prize was a guest designer spot with Fancy Pants – but the top 3 prizes got a ton of product - all you had to do was submit 3 to 5 items. I am a huge Fancy Pants fan and though I’d try my best because at the end of the day I’d end up with layouts I would love anyways. There were so many very cool entries that I kinda didn’t hold out much hope (Fancy Pants Pubcalls gallery - http://www.flickr.com/photos/86562421@N00/sets/72157601748956926/ ) My entries are the ‘Love’ Card, ‘love, live, laugh’ mini album, ‘wish’ layout and ‘delicate’ layout. I didn’t even know the winners were announced till a good friend emailed me and I basically did the scrapbookers thing and forgot how to breathe for a while. I loved this layout – it is now framed in my house. And it was also picked up by Scrapbook and Cards Today at Scrapfest Edmonton 2007 and published in their Winter 2008 Issue (link http://www.scrapbookandcards.com/ ) as the lead on layout for their Spring 2008 Issue. The layout that Anam won with!! Anything special you want pointed out on your project. Painted the Positive parts of the circle flowers in white and then drew with the PVA and added glitter to give it some sparkle. Key Lime Paper torn and use front & reverse of paper to create layering effect. We picked our winners!!! We went over all of our entries-several times!-trying to make a decision!! Let me just say, we had a very difficult time!! You all did such an amazing job! !Thank you so much for all of your entries! You are all truly talented!! Luckily for all of you, we decided to bump up our winners to 4 and one Honorable Mention!! We decided three winners was just NOT enough!! You all did a great job!! Hopefully you can use these projects as inspiration as you continue to create with Fancy Pants Felt!! 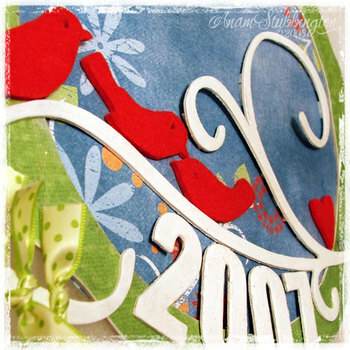 Roree Rumph created this totally cute card! We love how much the felt adds to such a simple card! Great Job Roree!! Danielle Flanders!! Great Job!! 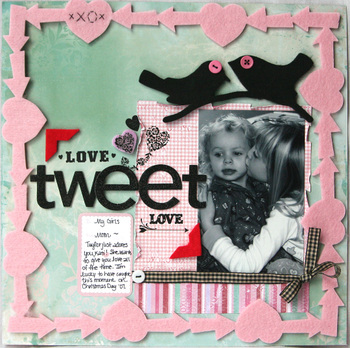 We love the way you used so much of the WITH LOVE felt in this wonderful layout!! Great Job Denine!! The felt adds so much dimension to this gorgeous layout!! Thanks so much!! Ann Costen!! Congratulations!! We absolutely loved the layout of this page, and the little hints of felt just make the page pop!! And last but not least!!.. Our Honorable Mention!! 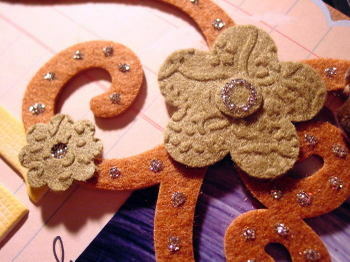 Wendy Gibson created this embellishment on her layout by embossing it! What a great idea!! Winners! Please email megan@fancypantsdesigns.com with your shipping information so i can get your fabulous prizes out to you!! Thank you so much for participating in our fun challenge!! Be sure to check back for the results!!! !- And for other great design tips and inspiration!! We have recieved quite a few entries...(all of which are wonderful!).. but would love to see more!!! Be sure to email them to megan@fancypantsdesigns.com before midnight on March 10th!!! You dont want to miss your chance at 1 of the 3 fabulous prize packages!!!! !